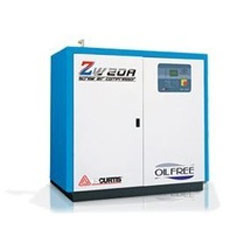 FS-Curtis, ZW-Series Oil Free Screw Air Compressor produce true oil-free air, free of any hydrocarbon. Water cools, seals and lubricates the compressor. ZW/ZWV Oil Free screw air compressors offer a completely integrated package. Clean lines and intelligent layout provides an unobstructed airflow that utilizes the chimney effect to provide even cooling with no hot spots even after the compressor has stopped. Intakes air from the coolest area eliminating air preheating. Key to the ZW/ZWV is the most advanced oil-free air end in the industry. No complex seals or gear arrangements provide a simple and rugged reliable air end. Water sealing-nearly ideal (isothermal) compression gives improved efficiency, lower energy consumption. These low operating temperatures and low speeds provide long life and lower maintenance costs. ZWV series use ABB standards and industrial inverter drives. Highly flexible AC drives can be configured to meet the precise needs of applications. ZWV can provide up to 35% savings compared to a standard compressor unit. High Efficiency. Water seals clearances for up to 15% less energy consumption. Optional Variable Speed Drive (VSD) reduces additional 30%-35%. High Quality Air. Totally oil-free, cool and contaminant free air. Environmentally Friendly Design. No gear noise, no oil, low discharge temperature. High Reliability. Low operating speed increases bearing life for reduced down time. Low Maintenance Cost. Air end does not require rebuilds, Low Life Cycle Cost (LCC) with ZWV. Totally oil-free air end, direct coupled drive, Y/D starter, TEFC motor, moisture trap, AIMS Plus Controller, emergency stop, quiet enclosure, auto dual control, pressure relief valve, air cooled/water cooled, heavy duty intake filter, multi-level safety system, water separation system, washable enclosure filter, rigid base with forklift slots, control voltage transformer, efficient water cleaning system. ZWV Standard Features: All ZW standard features plus ABB standard and industrial Inverter Drives for a VSD unit with up to 35% end user savings benefit.